The origin of this recipe is pretty much a culinary steam of consciousness. It starts last fall, when I visited Europe for the first time. Terry and I were lucky enough to spend a week in Paris at the Gentle Gourmet for Paris Vegan Day, and afterwards we took a train to Barcelona. The train ride was about 8 hours, and most of it was spent playing this flavor game we made up. We wrote down every flavor we could think of, closed our eyes and ran a pencil across the paper, picking four items at random. Then with our four choices, we imagined a dessert out of them. So while you may never want to try our lavender cream pie with candied mint, poppyseed shortbread and blood orange caramel, it was a really fun way to to spend a scenic train ride. Well, that and sips of thick espresso from the snack car. And the game does have some practical benefits. It’s really how lots of us cook – by inspecting our pantries and fridges for what might work and then throwing it together and hoping for the best. So when I was wondering what to do with some wheatberries that had been taking up residence in the pantry, I rolled the dice in my spice rack to see what would happen. I keep everything on a couple of lazy susans in a cabinet, so I just kind of twirl them around hoping for some inspiration. This reminded me of our train ride and picking out flavors, which instantly reminded me of Spain, and well, duh, of course I should make paella, or really “paella,” since it’s inspired by that dish, but not prepared the same way at all. Memories of Barcelona had whet my appetite for all sorts of flavors that I put together here. Saffron of course, but also roasted red peppers, leeks and lots of garlicky goodness. We didn’t eat anything exactly like this, but elements are roughly inspired by a restaurant we visited a handful of times called Organic. The end result is a homey dish, with lots of great texture. The wheatberries have a satisfying chewy bite that works wonderfully with the creamy chickpeas and everything is coated with a tangy, sultry broth, punctuated with a few briny capers. The actual hands-on work here isn’t at all tedious, you just need to do a little preparing ahead of time – mainly cooking the chickpeas and soaking the saffron, which take very little effort. If you’re not used to working with wheatberries, definitely give the recipe a read because who knows? You might be missing out on your favorite new grain! This is my favorite cooking method for perfectly cooked, plump wheatberries with great texture. Just place them in a 2 quart pot and submerge in water that covers them by 2 extra inches. Cover and bring to a boil. Let boil for 2 minutes then turn the heat off completely. Keep covered and let steam for another hour. They should be firm and chewy, but if you think they are a tad too firm that’s okay because we’re going to cook them the rest of the way in the paella. Drain and set aside. In order to get the most flavor from saffron, they need to be steeped. It’s very easy, just pour 1/2 cup of boiling hot water over the saffron in a coffee mug, cover and let sit for about an hour. Once ready to use, press against the saffron with the back of a spoon to crush it a little. It’s now ready to use. First you’re going to saute the leeks and set them aside. I love the delicate oniony-ness of leeks and it will get lost if they’re overcooked, so this method works wonders – we’ll add them back to the pan at the end. So… in a large pan over medium heat, saute leeks in 1 tablespoon olive oil with a pinch of salt for about 7 minutes, until tender. Transfer to a plate and set aside. In the same pan over medium low heat, saute garlic in 2 teaspoons olive oil for about a minute. Add the oregano and thyme and saute for about 30 more seconds. Add white wine, salt and saffron threads in water and turn the heat up high. Bring to a boil and let boil and reduce for about 3 minutes. Lower heat back to medium, add the cooked wheatberries, vegetable broth, tomato paste, roasted red peppers, bay leaves, capers and fresh black pepper. Let cook for about 15 minutes adding the chickpeas about halfway through. The wheatberries should absorb a lot of the liquid, but it should still be somewhat saucy. Remove bay leaves and taste for salt. Mix in the chopped parsley or cilantro and lemon juice. Turn off heat and let sit for about 10 minutes to let the flavors marry. It’s one of those things that will taste even better in an hour or so, so if you’ve got that kind of time then go for it, just gently reheat before serving. I’d loooove to make this, but unfortunately I gots da Celiacs and wheatberries are kryptoniteberries for me. Would you say kasha would make a good substitute, or am I missing a better option? Well rice is an obvious answer! Quinoa or millet, too. We’re going to Barcelona in two weeks! I’ve been warned the trip is going to be challenging for me at times, so I’m happy to know you’ve survived to tell the tale. I usually do my wheatberries in a pressure cooker, but I’m excited to give this recipe a shot. Hello from Australia! This looks sensational, and I’d love to make it, but I’m not sure what wheatberries are, because i can’t find anything here that’s called by that name. Is it just whole grain wheat, or something else? I spent one weekend in Barcelona and at ate Organic three times. Best salad bar ever and el cheapo to boot! Hot tip on chickpeas that may rock your world. Rather than soaking overnight, cook them when they’re dry and hard. Simmer 4 hours in spring water (4 hours at sea level, and longer at higher altitudes), adding water as needed. They’re tremendously rich and nutty — not like any chickpea you’ve ever tasted. You’ll never, ever soak again. PS Wheat berries are often sold as “hard winter wheat.” Check ’em out as hot cereal with sliced fruit, plant-based milk, and a few drops of your favorite sweetener. I was just thinking the other day that I need another recipe that uses wheatberries. This is perfect! I wonder how this would taste with freekeh,…..smoked, cracked wheatberries? Probably wonderful! I love the clean, fresh, zingy flavors — I may swap out the wheatberries for barley, my current grain obsession. Made this last night. Very tasty. One note, you don’t say when to add the leeks to the dish, I put them in with the chick peas. Made this tonight and it was fantastic. My 14 month old daughter devoured it too! Made this last week with bulgar — sooooo good. Had my co-workers drooling over my leftovers at lunch the next day. This is my new favourite meal. I made it a couple nights ago and even had my meat-eating bf anxious for more. I can honestly say that I will probably make this delicious and easy dish once a week for a long time to come. Thanks Isa! where can I get Saffron…and is there a sub for it? I have looked everywhere and its either crazy expensive or non existance. As usual, delicious recipe. Thank you! Love this one too, I’ll be making this for dinner. Oh God, what would I do without you to save me in winter? I was getting short on soup-ish concoctions! This is my new favourite dish! I must have made it four times in the past 2 months. It’s easy, delicious, and looks so pretty that it’s perfect for dinner parties! Thanks for the great recipe. I have never tried that method for the wheatberries. I am excited to give it a go! i’ve tried a couple different veggie broths, and i always find them to be too tomato-y. Do you make your own veggie broth? or what brand would you suggest? I switch it up, sometimes make my own but sometimes i use the Better Than Bullion kind. I also like Frontier brand, but not in huge amounts. I don’t have saffron threads; any good suggestions for a substitute? Honestly, this would be good without. It just won’t have that paella taste. Love, love, love this… as do my non-vegan family and friends. The flavors are amazing and i love how the leftovers are even better. I did run out of saffron the last time I made it and I can vouch for the fact that it is far more significant flavor-wise than I had given credit for in past makings. 🙂 I was thinking of trying this with barley just for fun. This was vegan dinner #5 of 5 in our veggie house this past week, and it took the prize for most delicious. Served it over zucchini ribbons lightly sautéed in oil. What a special dish! I think I will be making this for an upcoming birthday celebration. I was also totally pissed that my husband ate the leftovers. I can’t believe I forgot to bring them for lunch and beat him to it!! This was good without saffron or capers. Ada, let me know how it goes with barley. I was thinking that myself or maybe quinoa. Is it just me or are wheatberries a bit tough? Going to add olives next time. Another one reporting back on how much they enjoyed this recipe. Both me and my Mum loved it 🙂 I also used up all my saffron a couple of weeks ago and haven’t yet replaced it so had to make this without. It was still fabulous so I can only imagine it is extra-delicious with it! Many thanks. yammm yammmm one of my favorites LOVE the texture of the wheatBerries! 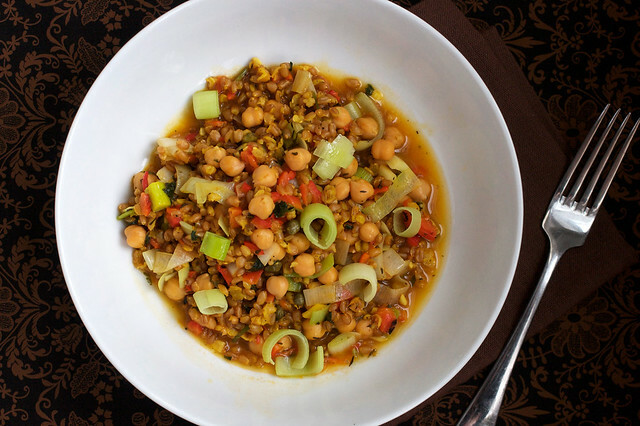 Wheatberry Garbanzo "Paella" - Eat Well. Party Hard. We made this a week or so ago and it is a house favorite. Am making it for dinner guests tomorrow. Making the wheat berries, looks and saffron a day before. Hope that works!